The eyebrow line is buff in front of the eye, white behind, and broad in back, not tapered. It continues back to the nape of the neck. The throat is white and unstreaked. The breast and belly are white. The flanks and undertail coverts are tinged buff. 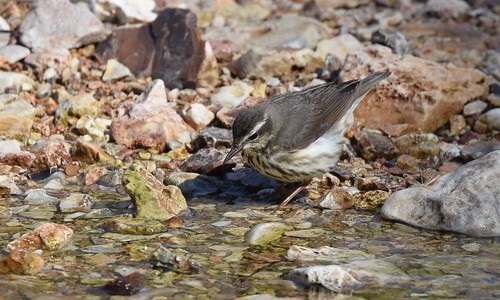 Northern Waterthrush (Seiurus noveboracensis) eyeline is buff throughout, tapered to a point in back, and ends well before the nape of the neck. The throat is finely streaked. The underparts are buff. Terrestrial and aquatic insects, crustaceans, earthworms. This species was formerly included with the ovenbird in the genus Seiurus. 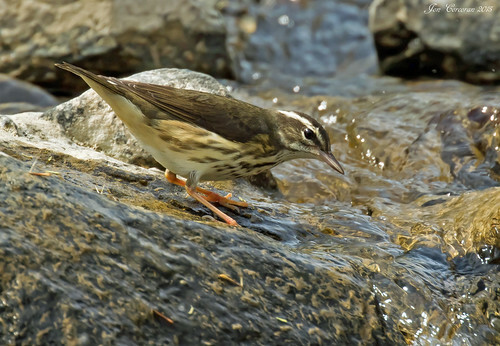 Recent mitochondrial DNA studies suggest that the waterthrushes are not closely related to the ovenbird. The genus was split and the waterthrushes were placed in the new genus Parkesia. Louisiana Waterthrush (Parkesia motacilla) gathering nest material and going to a hole in a stream band to build their nest. 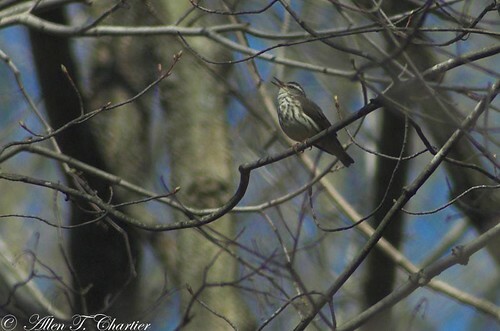 A Louisiana Waterthrush (Parkesia motacilla) sings while defending its territory along River Road in Kent, CT.
Birdchase: Episode 1: Search for the Louisiana Waterthrush. A pilot for a possible series.